You’re playing VR in seated mode and physically facing forwards, and your avatar is standing at a cross roads facing North. You look around and notice something interesting to the East and you decide to head off that way. Your head is now almost 90 degrees to the right. You turn your head back forwards and turn your view using the joystick or ratchet “comfort” buttons. In doing so you take your eyes away from the direction you are most interested in. Step 1: Your physically looking “forwards” and your view is North. Step 2: You physically turn “right” and your view is East. Step 3: You tap the CTRL or XBox Left Thumbstick Button to reset your forward direction to the current view (East). The world starts auto-rotating to the left. Step 4: You start to lose sight of East, but no problem you can turn your head left and track it as it turns. 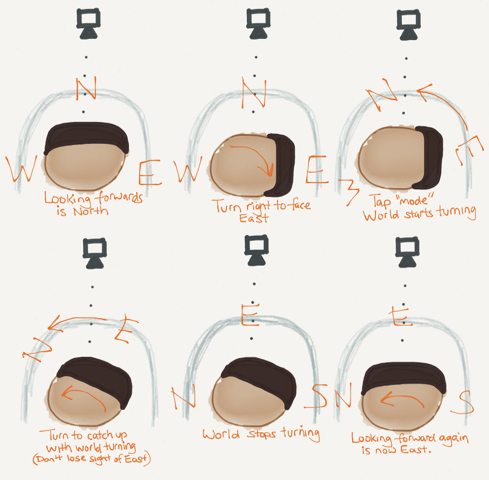 Step 5: For example, you stop turning, and the world finishes rotating so forwards is now East. Step 6: You turn physically back to look “forwards” and it is now East.